External analgesic patches for temporary pain relief. Temporarily relieves minor aches and pains of muscles and joints. External analgesic for temporary pain relief. Clean and dry the affected area before application. Remove the attached film from medicated patch and apply adhesive side to the affected area. 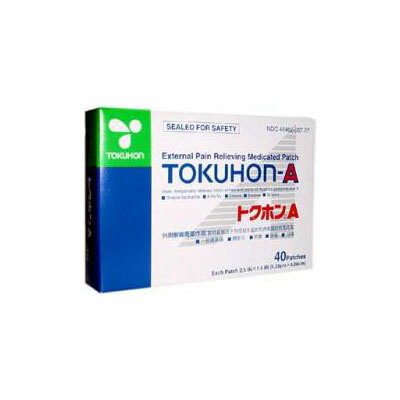 Adults and children 2 years of age and older, apply to affected area not more than 3 times a day because it will remain effective for about 8 hours in normal conditions. It will be more effective when used after hot shower or massage. For external use only, avoid contact with the eyes. Do not apply on wounds or damaged skin. Do not bandage tightly. Use only as directed. Discontinue use if excessive irritation of the skin develops. Stop use if condition worsens, or symptoms persist for more than 7 days, if this occurs, consult a physician. Children under 2 years of age, do not use. Do not apply on wet or sweaty skin, extremely hairy surface of skin. Store unused patches in a tight container at a temperature not more than 86ºF (30ºC).